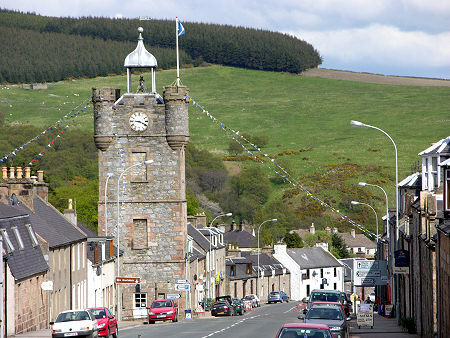 The village of Dufftown dates back to 1817 when it was developed by the Earl of Fife, James Duff. Nearby Mortlach, in the the valley of the Dullan Water, was already a long-established settlement by this time, but has since been overshadowed by its later neighbour. Mortlach is probably at least a thousand years older than Dufftown. The earliest parts of Mortlach church date back to at least the 700s, and there has been a religious community here since the arrival of St Moluag in the late 500s. Most of what you see at the church today dates back to a major rebuild in the 1200s. There was also a monastery here by 1200, and in 1228 a parish school was in operation. The immediately surrounding area is also steeped in history. 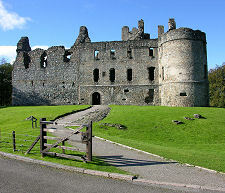 Balvenie, a mile to the north, is home to Balvenie Castle, which dates back to the 1200s. The name of Balvenie comes from the Gaelic for village of monks, suggesting there was a monastery established here, too, before the castle was built. Balvenie Castle was abandoned by 1720 in favour of Balvenie New House, built half a mile to its north. This, too, stood empty by the late 1800s and became part of Balvenie Distillery. Two miles south of Dufftown is Auchindoun. This was the site of an Iron Age hill fort, within which was later built Auchindoun Castle, a tower house constructed in the 1400s. The castle was the base of Adam Gordon, who in 1571 burned down Corgarff Castle and killed 28 women, children and servants of the Forbes clan. Auchindoun was itself damage in a separate quarrel with the Mackintoshes, but was later rebuilt before being abandoned around 1700. Dufftown promotes itself as the Malt Whisky Capital of the World, and no one seems inclined to challenge that claim. 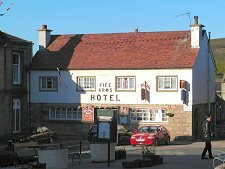 In or close to the village there are six operating distilleries. These are Dufftown and Mortlach to the south of Dufftown on the Dullan Water; Glendullan to its east on the River Fiddich; and Balvenie, Kininvie, and Glenfiddich, all owned by William Grant & Sons Ltd, to the north. There are three more closed or mothballed distilleries in or around the town: Pittyvaich, Parkmore, and Convalmore, the latter used as warehousing for Balvenie. 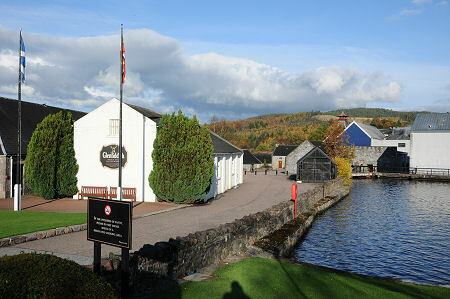 Of these distilleries, only Glenfiddich offers a visitor centre, though it is an excellent one, and both Glenfiddich and Balvenie offer distillery tours. In addition to the distilleries in and immediately around Dufftown there are many more within a few miles of it. Dufftown feels like the planned village it is. 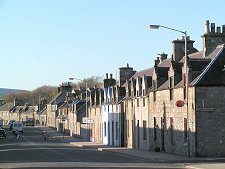 Its focus is the main square: quite literally as this is at the intersection of the roads running into and through Dufftown. 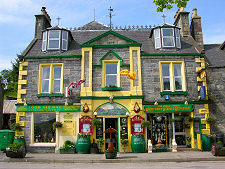 In the centre of the square is the distinctive clock tower, also home to the village's Tourist Information Centre. Dufftown Museum, at 24 Fife Street, houses a collection of exhibits, much of which is related, unsurprisingly, to the history of distilling. 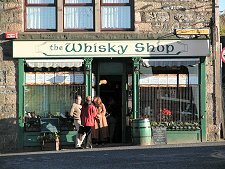 If you want to find out what all the fuss is about, you could do far worse than calling in at the Whisky Shop, facing on to the main square. 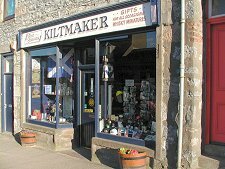 And, perhaps, afterwards, so you can look the part, the kiltmaker just down the street. 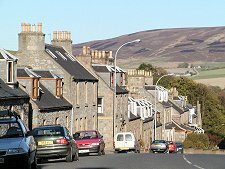 Dufftown also lies at the end of a short spur linking it to the Speyside Way long distance footpath. Just beyond Glenfiddich Distillery on the road to Craigellachie is the old Dufftown Railway Station. This is now a terminus for the Keith and Dufftown Railway which runs seasonal services for the 45 minute trip to Keith.